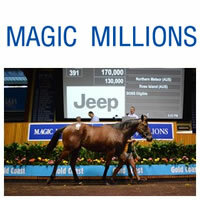 A pair of outstanding colts shared the honours as prices soared with the 2015 Magic Millions Gold Coast March Yearling Sale declared a “roaring success” after another great of selling on Tuesday. Thanks to a revitalised QTIS scheme, increased prizemoney and the announcement of Australia’s richest raceday including a $1 million QTIS feature, the sale gross rose 57 per cent on last year’s auction and the average price climbed over 36 per cent. The clearance rate was a record for the March Yearling Sale at 81 per cent. Youngsters by Turffontein and Northern Meteor topped the day’s proceedings and rounded out the sale with the honour of being joint sale toppers when selling for $170,000. Top Brisbane trainer Kelly Schweida secured his top pick of the sale, the Turffontein half brother to his talented stable runners Cape Kidnappers and Tiger Dimejan early on Tuesday afternoon. Catalogued as lot 270, the bay colt was presented at the sale by Glenlogan Park. He is the seventh foal of the city winning and top producing Red Ransom mare Kidnapper. “I was delighted to be able to secure a colt by Turffontein – I tried to buy Fontiton – so let’s hope this colt can do the job,” Schweida added. Meanwhile, Lot 391, the Northern Meteor-Rose Island colt from the draft of Wattle Brae Stud sold late in the evening for $170,000 to leading trainer Barry Baldwin. The colt is the third foal of the lightly raced Fusaichi Pegasus mare Rose Island – a half sister to group performer Bound to Blush. He hails from the same family as Group One winner Keeper. “He’s a nice, neat colt who looks the ideal horse for next year’s Magic Millions (2YO Classic),” Baldwin said. “I train the half brother Great Inaque and he’s already won four races and he should have another couple of wins in him as well,” Baldwin added. The colt was born and raised at Wattle Brae Stud and left the farm for the first time to come to the sale. David Mee’s Pinhook Bloodstock joined with leading Toowoomba trainer Tony Sears to secure Missy Longstocking’s full brother from Lyndhurst Stud Farm (Lot 289) for $120,000 – the third top seller of the day. The chestnut colt, catalogued as Lot 289, is the fourth live foal of the three time winning Thunder Gulch mare Linyanti. Like his full brother, the colt is by Sequalo. Another highlight was the sale of Banchory Thoroughbreds’ Written Tycoon-Nemcova colt for $90,000 to well known racing identity Norm “Whopper” Stephens on what was his 84th birthday. At the close of the sale over $8.68 million (up 57% on 2014) was traded on 297 lots sold at an average price of $29,227 (up 36%) the clearance rate soared to 81 per cent – well up on the 69 per cent recorded last year. “The success of the sale can be wholly attributed to the prizemoney increases in Queensland racing. To view the sale results and to make an offer on a passed in lot click here.